Dr. Mulder has been performing hip and knee replacements almost exclusively for five years. Although there are many treatments to consider when a patient is experiencing hip pain, Dr. Mulder always begins by assessing the pain based on how it is affecting the patient’s everyday life. “If they say, ‘once a month my hip is a little sore after I mow the lawn’ and that they have bad arthritis, that’s something they can probably live with and work around,” said Dr. Mulder. Dr. Mulder will discuss surgical treatments in more severe cases where the patient has issues such as not being able to sleep at night, no longer able to perform common daily functions like putting on their socks or having issues getting in and out of their car. Treatments that Dr. Mulder will prescribe range from a physical therapy plan and/or an over-the-counter medication, to a more invasive treatment like an injection. When non-surgical options have failed, he begins to discuss the possibility of a hip preservation surgery or often times, a full hip replacement. “When the hip arthritis is negatively affecting a patient’s quality of life on a daily basis, I will recommend a hip replacement because I know that we can decrease pain and increase function,” said Dr. Mulder. In the five years, he has been practicing, the introduction of robotic-assisted technology has revolutionized the way Dr. Mulder performs his surgeries. 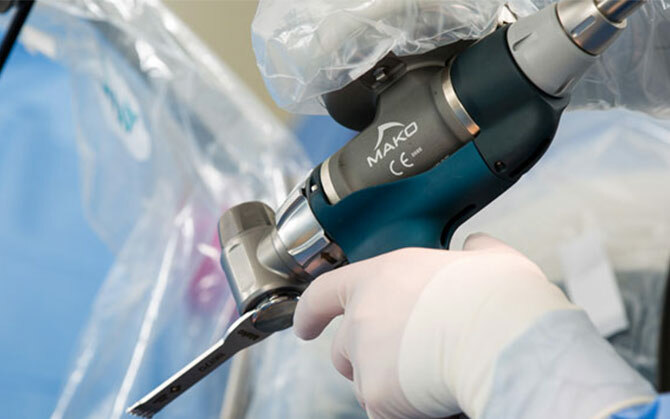 The Mako Robotic Arm Assisted Surgery technology gives surgeons the advantage of planning ahead much better than before. They are able to see a CAT scan of the patient’s hip prior to entering the operating room and making any incisions. The technology allows the surgeon to perform various computer simulations on the 3D model of the hip. During these simulations, different sized parts in various orientations are fit into the digital model to create the perfect combination. The surgeon can see the end result and what the construct will be before performing surgery on the patient. During the surgery, the robotic arm then guides the surgeon based on the computer simulations to get rid of arthritis and place the parts in the correct spots to the exact degree and millimeter. This new technology helps the surgeons become more efficient, cuts down on the number of steps required, and creates a reproducible successful surgery. “It’s like having one person build a car from scratch versus having it on an assembly line where everything is done the exact same way, every time,” explains Dr. Mulder. While Dr. Mulder can’t say for certain that using the robotic technology creates different long-term results just yet, he does consider that we may find that robotic hips are lasting longer, having fewer complications and that fewer hips will need to be redone in the future. Dr. Mulder explains that the potential advantage for a faster, earlier recovery is that there are fewer steps repeated with the robotic assistance, less time in and out of the hip, and less tension on the muscles and tissues during the surgery. Overall, it is the efficiency of the robot that lends to a potentially quicker recovery. Can You Prevent Hip Pain and Arthritis? While there are no magical remedies to prevent hip pain, Dr. Mulder says there are some healthy living tips that can help over time. In terms of the pressure your hip and knees endure, weight loss can make a huge difference. For every five pounds you lose, less stress will be placed on the hip and can help it feel better. “It’s like any other mechanical system…the more stress or the more force it sees, the more it is going to wear out,” explains Dr. Mulder. The other healthy living tip he recommends is to stay active. Bones and joints enjoy weight-bearing activities like biking, elliptical machines, hiking, and walking. “I find that the people who are living the best with their hip pain are those that have stayed active.” If you or a loved one is experiencing hip pain, please contact Dr. Mulder at St. Cloud Orthopedics for a free consultation.